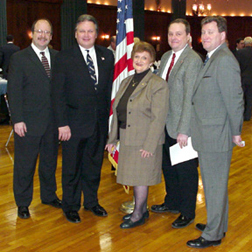 The Hasbrouck Heights Chamber of Commerce sponsored Regional Business Information Forum dinner meeting on Wednesday, January 15, 2003 at the VFW Post 4591. The business community received first hand information about the economy, corporate and proposed taxes and fees, regional transportation issues, impact of the Meadowlands proposals, etc. 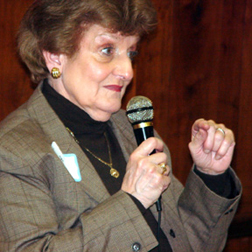 Rose M. Heck , Assemblywoman District 38, Former Councilwoman and Mayor of Hasbrouck Heights, Member of the Assembly Appropriations Committee, discussed the Meadowlands proposals and their impact on the environment, local businesses and transportation. In addition, she presented a status report on the northern spur of Light Rail in Bergen County (Ridgefield, Leonia, Englewood, Tenafly & Hackensack) that will connect to Hoboken. 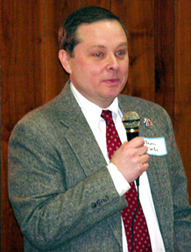 Arthur J. Maurice, Vice President New Jersey Business and Industry Association, discussed energy, economic development and the corporate business taxes which were retroactive to January 2002. Also discussed were how LLC's, partnerships and "C" corporations would be affected. 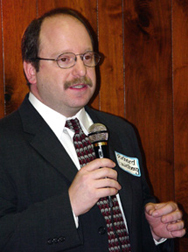 Richard Goldberg, President Commerce and Industry Association of New Jersey, presented CIANJs Legislative 2003 Agenda which included topics on: taxes, environment, regulatory reform, state mandated labor benefits, economic development and transportation. 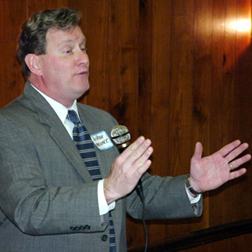 James Clifford Greller, Executive Transportation Planner -- New Jersey Institute of Technology, spoke about the Hudson Bergen Light Rail and public transportation projects proposed for Bergen & the Northeast Region. 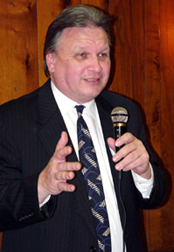 He discussed the new tunnel to Penn Station and that it would do nothing for Bergen County. But, he suggested, a third tunnel connecting Hoboken and the Secaucus Transfer Station to the 14th subway (Carnise Line) could be operational in 3 years. He noted that the 14th Street Subway connection was originally designed to connect to the Meadowlands in 1926, but was never implemented. Once completed, Meadowlands to midtown subway system would take only 17 minutes. Currently Penn Station riders must take a train to Hoboken, then a Ferry or PATH and then a subway to travel 12-20 miles.